The Columbans in China, together with the entire Chinese people, rejoiced at the end of World War II, which had caused so much death and devastation in that country. Unfortunately, shortly thereafter the civil war between Chinese Nationalists and Communists, which was going on before World War II, resumed with a vengeance. By 1947, the Communists, under the leadership of Mao Zedong, were advancing and taking control of large regions of China. In 1947 Columban Father Patrick O’Connor was stationed in Tokyo, working for the National Catholic Welfare Conference (N.C.W.C.) as a special correspondent for East Asia. Father O’Connor wrote an article, based on one of his dispatches, which appeared in the March 1947 issue of The Far East magazine. The article detailed the growing power of Mao’s communists, and their increasing persecution of foreign missionaries in China. 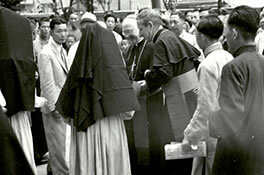 Father O’Connor warned that the situation for the Columbans and other missionaries, along with people of all religions in China, would greatly worsen if Mao seized power over the entire nation. His article proved to be prophetic. Within just a few years Mao and his Communists would take over the whole of China and expel the Columbans from the country for which they were established to evangelize.